As of 4:34a.m. 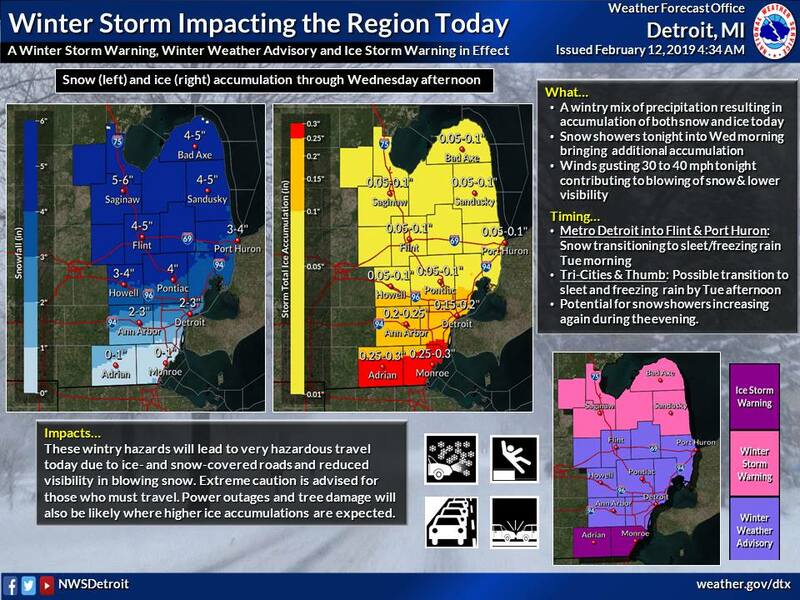 the National Weather service released the latest forecast of how much snow and ice the Fenton, MI area should expect today through Wednesday. As you can see in the map below, Fenton should expect snow accumulations up to 4 to 5″ with ice accumulations up to .1″. Snow, freezing rain, and sleet before 10am, then freezing rain likely between 10am and 1pm, then rain after 1pm. High near 35. Breezy, with an east wind 16 to 21 mph decreasing to 7 to 12 mph in the afternoon. Winds could gust as high as 32 mph. Chance of precipitation is 100%. Total daytime ice accumulation of less than a 0.1 of an inch possible. Total daytime snow and sleet accumulation of around an inch possible. Rain before 10pm, then snow likely. Areas of blowing snow after 10pm. Low around 22. Breezy, with a west southwest wind 11 to 16 mph increasing to 19 to 24 mph after midnight. Winds could gust as high as 40 mph. Chance of precipitation is 80%. New snow accumulation of around an inch possible. A chance of snow showers before 1pm. Areas of blowing snow. Cloudy, with a high near 27. Breezy, with a west wind 21 to 24 mph, with gusts as high as 41 mph. Chance of precipitation is 30%.